The CD57 antigen (HNK-1 antigen carbohydrate moiety) is an oligosaccharide with sulfated glucoronic acid residues that may be linked to a variety of polypeptides or lipids. In peripheral blood, it is found on a subset of cells with natural killer activity. It is confined to mononuclear cells, primarily large granular lymphocytes. 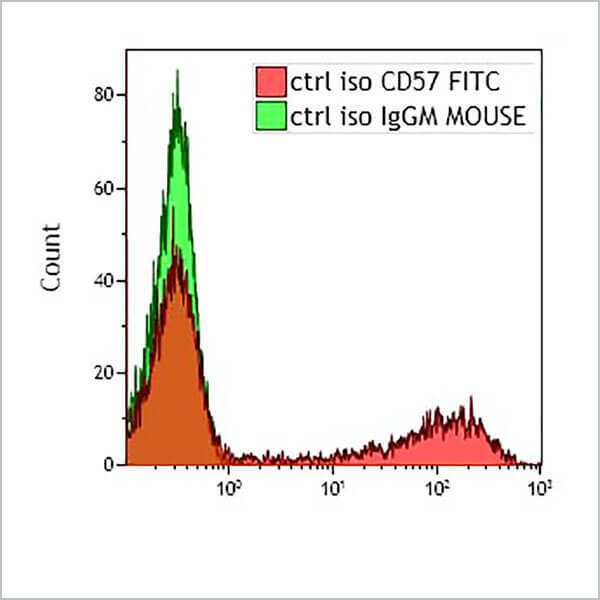 Many of these CD57+ cells co-express the CD8 antigen and are a subset of the suppressor / cytotoxic T lymphocytes. Cord blood T cells or NK cells lack the CD57 antigen. It is not expressed on red blood cells or on platelets but is present on some neuroectodermal tissues.